Order your Retro 51 Stealth Tornado Deluxe 1.15mm Pencil today from FahrneysPens.com. Fine Pens, Refills & Luxurious Gifts – great prices & fast shipping. Retro 51’s popular thick-lead pencils let you power through your notes, sketches, designs and ideas with ease. Let them know you mean business with Retro 51’s black-on-black Stealth Tornado, with its matte black barrel and glossy black clip and trim. 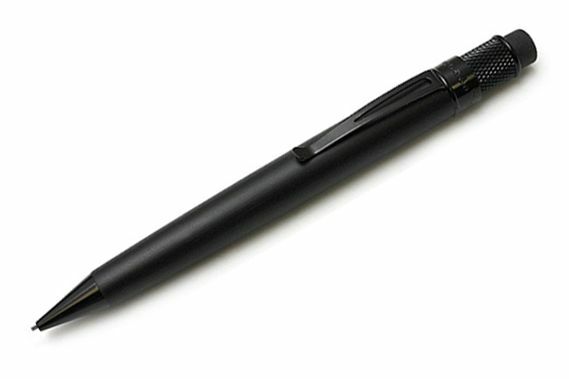 The pencil features a twist-advance mechanism, thick 1.15mm lead and a large black eraser. A great choice for those who prefer understated style! Each pencil comes in a custom tube with extra lead and erasers. Matching rollerball and rollerball/pencil gift set also available.